Today I’m taking part in my first blog linky! Hence the above logo. 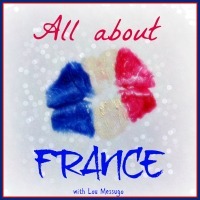 We’re all blogging in/about France, so do check out what everyone is doing. In my portion of France, it’s been extremely windy lately with alternating sunshine and showers. I had an appointment in town yesterday and had to park a fair way away from it. I didn’t have an umbrella with me and there was no indication of what was going to happen, but that wind moves things quickly. When I came out I was caught in a deluge, which I’m not certain didn’t contain some tiny hail in it too. In the few minutes of walk I had to the car I was completely drenched. I looked as though I’d been swimming. I popped into a shop to get some groceries and wouldn’t you know it…the rain not only stopped but the sun shone and blue skies appeared. I looked even more ridiculous by the time I stepped out of the shop, no-one else nor the sky showing any signs there had been any rain at all. Which, finally, brings me to this post’s subject: – plants in our field/garden which have been blown in from elsewhere and thrive without any interference from me. They’ve all, no doubt, been transported by the strong winds we have, dropped onto our very fertile ground here that seems to let grow new plants from any bits of other plants I cut off and simply stick back into the ground, then are alternately being watered with the rain and encouraged to grow with the sun every few hours. We have lots of yellow cowslips and a few white and mauve primroses, which look fantastic as they multiply across the field, also being interspersed with what I understand are common blue violets and some other blue field flower. A neighbour says she waits until the primroses have finished flowering then mows the lawn leaving the mulch on it, to encourage them all to spread for next year. She certainly has a pretty front lawn full of multi-coloured primroses, so I will be doing the same. Amongst all of this chives are sprouting. Lots of them. Springing up in different areas. From their positions and the way that they grow you can tell these were not cultivated. I also found some pansies around the back of a building – as it’s an area rarely gone to, I’ve moved them so that they can be appreciated more often and luckily they are thriving in their new home. Set off amongst these flowers is a tree that we thought was dead. It didn’t show even the slightest sign of life last year but this spring it is in full white blossom. I’ve not had fruit trees before so I don’t know whether some species only flower every two years. Meanwhile, the sour cherry trees and a couple of apples, which brought us lots of fruit last year despite looking old and not in great condition, and that I thought would give us a beautiful spring display this year, don’t look as though they will be doing anything. It could be too early, but I would have thought they would produce more signs of life by now. Luckily, I didn’t badigeon all the trees, so I know it is not my intervention which has caused this. Phew! I do love the way there’s always something new to discover as I get to know this garden though, and all these self-seeded flowers have reminded me that I don’t want my field to become a manicured garden. I want it to be a garden but remain fairly wild – which also fits my lazy style of gardening. Do you have fruit trees and can give tips on how they behave? Or do you have windfall plants that you welcome in your garden?